Members get a $1.00 discount on this item at check out. Tags: Apparitions, Blessed Jacinta Marto, Fatima. 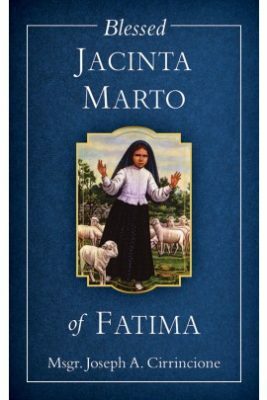 Jacinta Marto was one of the three little children who saw the Blessed Virgin at Fatima, Portugal in 1917. From May May 13 through October 13 Our Lady appeared to the children six different times. Jacinta died shortly after, at the tender age of 9. Yet in her brief lifetime, especially after the appearances of the Blessed Mother, she achieved heroic sanctity, and was declared Blessed by PopeSaint John Paul II in 2000. Here, Msgr. Joseph A. Cirrincione, retells the profound story of the Fatima apparitions and gives the account of the inspiring last months of Bl. Jacinta Marto. Singularly striking about her life after the apparitions was her total dedication to the work of saving souls; Jacinta took every opportunity to do penance for the conversion of sinners, and in the process won a high degree of sanctity for herself. No one can Blessed Jacinta’s story without seeing the hand of God in her life. Having seen the Blessed Mother and, famously, a horrific vision of Hell, Jacinta could never again regard life the same as most people. This is the story of a little girl who responded to great grace and completely dedicated her life to the work of saving souls.